with the Lovenotes in Waikiki. IT was just another rainy night for Rene Uchida and Jebelyn Carino who were on the way to Jack In The Box when they noticed four guys in a car next to them were checking them out. One of the guys saw the girls had seen them and yelled, "We want to sing for you." Minutes later the girls were being serenaded on a Waikiki street corner. They discovered their admirers were Dwayne Anders, Bruno Hernandez, Joey Kaalekahi and Reid Kobashigawa and the foursome performed five nights a week as guests of the Lovenotes at the Ilikai Hotel. "No one ever did that before. Never," Uchida says. 8:30 p.m. Wednesday through Sunday, Backstage Showroom, Ilikai Hotel. Admission is $10; parking free with validation. Call: 949-3811 or 922-1886. Hernandez says singing for two girls they'd never met was totally unplanned. "We'd had a great show that night and we were ready for anything. We saw those two girls and something had to happen," he says of the street corner performance. Anders couldn't believe they were doing it even as it happened. "When Reid went out (of the car) we all had to follow. I think they were shocked we could sing but now it's one of those romantic things you'll always remember." Uchida and Carino have since seen the group perform several times at the Ilikai. They enjoy the classic doo wop harmonies of the Lovenotes as well, although both say for the rest of the week they listen to Xtreme, I-94, and Jammin' 93.1. The guys share those sentiments. They say they enjoy doing songs by the Isley Brothers and the Temptations on stage but are also working on a 21st century repertoire. "Joey and I were singing some oldies in this other group before we met Reid and then Bruno, but modern music is more where we're going," Anders explains. The history of the group to date is short and simple. 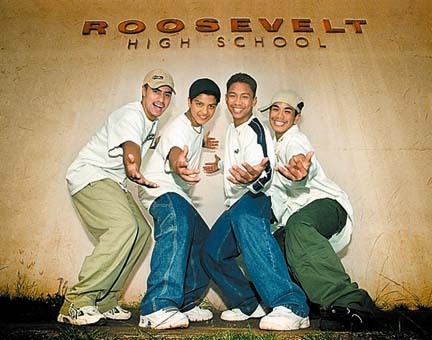 Anders and Kaalekahi were working out some vocal arrangements with Kobashigawa when Hernandez, now 14, became a Roosevelt student. Kaalekahi asked Hernandez if he'd like to join them. "I always wanted to be in a group," Hernandez says. A professional entertainer while still in pre-school, he was the Lovenotes' headliner for years as "the world's youngest Elvis impressionist." In more recent years, Hernandez has proven himself much more than a novelty act. Hernandez told his father, Lovenotes leader/executive producer Pete Hernandez Sr., about the group and asked if they could audition. That was several months ago. The School Boys have been appearing with the Lovenotes ever since. At the Ilikai they're singing oldies, but the guys say Backstreet Boys and 'N Sync are their role models. Kaalekahi says they're looking at ways to distinguish the group. Original songs and choreography are part of the agenda. So is a new name. "It's temporary just for the show doing 50s things and we'll keep it until can think of something better, but we're looking for the right name. It has to be right," Hernandez says. They're also looking for a fifth member. A potential School Boy must be 18 or younger, "fun," serious about a career in music, and willing to sing oldies as well as contemporary material. And Anders, who just turned 18, hopes he'll have a car (He's not only the "old man" of the group but the only one with a car). And there's one thing. Any one who wants to be a School Boy should be ready to sing for the ladies "anytime anywhere." Even on a street corner in the rain. The Lovenotes have settled in at the Backstage Showroom at the Ilikai and the news is all good. The guys are featuring the traditional "doo wop" material they do best, their show is as tight as it has ever been, and with the School Boys replacing a problematic guest of last year's production the Lovenotes have added teen appeal. 'Notes leader Pete Hernandez Sr. presides as host and narrator of a 90-minute show that offers a well-paced look back at the big hits and legendary artists of the '50s and '60s. Harmonies are the thing; celebrity impressions are wisely kept to a minimum. All in all this is the most fully satisfying Lovenotes show since their early days and proof again that they are Hawaii's ultimate oldies group.